Republican presidential candidate Wisconsin Gov. 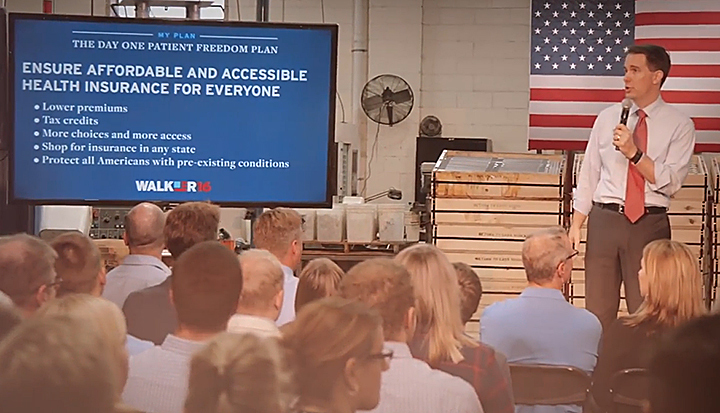 Scott Walker has released a new web video highlighting the contrast between his bold plan to repeal and replace ObamaCare with a solution that gives all Americans freedom over their health care decisions and Hillary Clinton’s broken promises in defense of the failed law. Click here to watch the video. In the video, Walker says, “Like I did in my state, I’m going to tell you I’m willing to stand up against anyone, including members of my own party, to get the job done. A lot of candidates talk about repealing Obamacare, we’ve actually got a plan to make sure Congress acts because they’re going to have to live under the same rules as everyone else in America.